I should preface this review by saying, at the time of writing this review (January 2019), I've yet to see the new Aquaman film and I have no familiarity with these characters and storyline. I don’t know if that made me more or less likely to enjoy this standing on its own, but I thought it was a pretty fun story regardless. Mera is a fairly stereotypical, run-of-the-mill superhero/princess type, and there’s really nothing about this story or these characters that stands out as original, unique, or creative, but despite all of that, it’s a likeable (if predictable) plotline with really stunning artwork. 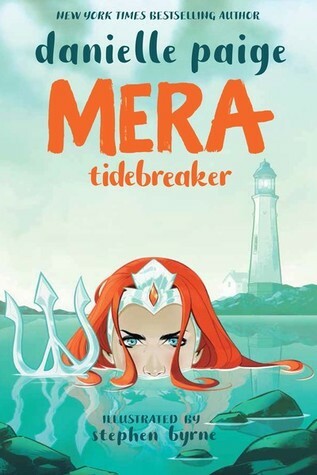 If you’re looking for something to blow you away, I doubt it’ll be Mera: Tidebreaker, but if you’re just looking for a good time with some action and a cool oceanic setting, she’s your girl. Sign into Goodreads to see if any of your friends have read Mera. Leanne wrote: "Is that unusual? I’ve never heard of that"
It's reallllllly common in comics reviewing, and since DC is a comics publisher that's their default stance. No reviews until release day. Alex Can Read wrote: "It's reallllllly common in comics reviewing, and since DC is a comics publisher that's their default stance. No reviews until release day." I didn't know it was common with comics! I can see why, though. I mostly review graphic novels like Oni Press, etc., and they're not as strict. I feel like publishers have every right to be strict, though, so I'm not complaining! There's quite a few reviews on GR though. What do you think of Danielle Paige's involvement with Full Fathom Five? I will always think her titles are ghost written because of it. Clare wrote: "There's quite a few reviews on GR though. What do you think of Danielle Paige's involvement with Full Fathom Five? I will always think her titles are ghost written because of it." Yup, and they're breaking the embargo rules. :) Good on them if the publishers don't ask them to remove the reviews but it doesn't change the rule. I honestly know nothing about that, sorry. I've never read anything by Danielle Paige before this and didn't really recognize her name. Hey, if you don't mind me asking where did DC Comics post about the embargo rules? Just curious as I am reading this title now and wanted to review it but I don't want to break any rules. Julith wrote: "Hey, if you don't mind me asking where did DC Comics post about the embargo rules? Just curious as I am reading this title now and wanted to review it but I don't want to break any rules." "All review coverage is embargoed until publication date on April 2, 2019." Madi ~☆TheBookNerdDiaries☆~ wrote: "Julith wrote: "Hey, if you don't mind me asking where did DC Comics post about the embargo rules? Just curious as I am reading this title now and wanted to review it but I don't want to break any r..."
"Do not publish your review before the release date unless prior arrangements have been approved by one of our publicists." destiny ♡⚔♡ wrote: "Madi ~☆TheBookNerdDiaries☆~ wrote: "Julith wrote: "Hey, if you don't mind me asking where did DC Comics post about the embargo rules? Just curious as I am reading this title now and wanted to revie..."
Julith wrote: "destiny ♡⚔♡ wrote: "Madi ~☆TheBookNerdDiaries☆~ wrote: "Julith wrote: "Hey, if you don't mind me asking where did DC Comics post about the embargo rules? Just curious as I am reading this title now..."
Ellyn wrote: "Destiny, Aquaman is such a fun movie, I definitely recommed it! 😍"
Awesome, thank you, love! I'll have to check it out some time!